Defending Catholicism against the ignorance and prejudice of Fundamentalists, Mormons and others is often diffi cult and discouraging. So many time-worn arguments and misunderstandings divide Catholics from our separated brethren that it’s hard to even know where to begin. 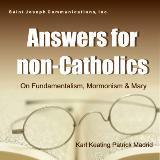 However, in this classic apologetics series, Answers for non-Catholics two well-known Catholic apologists shows how making the case for the Church with non-Catholics can be done in a way that is effective and profi table for them—and for you too! In the fi rst talk of this series you’ll learn why answering “Bible Christians” is not so much about opposing Fundamentalism as explaining Catholicism. As you listen, Karl Keating shows how to point out the weaknesses of Fundamentalism. And you’ll learn how they really don’t take their beliefs from the Bible, as much as they use the Bible to substantiate what they already believe. Most importantly, you’ll discover that the skills of a good apologist are not those of a good orator or debater, but of a good missionary. And how, through you, they will have their fi rst glimpse of the true unity of Christianity.